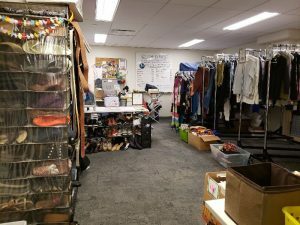 ReUSE is a campus not-for-profit thrift store run by student volunteers. We take donations from the Cal community and give them back to the community via our store. Books, readers, and office supplies are all free. Everything else in the store is $3 or less. Things we can’t sell or give away are donated. All proceeds go to charity and maintaining the club. So, it’s Earth Month. What does ReUSE have planned? Freecycling – Wed. April 10th 12-3PM: We’ll be giving out free office supplies and clothes on Sproul to promote sustainability and reach a different crowd than the people who usually frequent the store. Cal Day – Sat. April 13th 9AM-4PM: Join us in the student org madness on Sproul to pass out free books, binders, and clothes and to help spread the word of ReUSE to incoming students. ReUSE General Meeting – Thurs. April 18 7-8PM: Come hang out with ReUsers in the store at our next general meeting! We will most likely be preparing for tie dye, talking about move-out, and maybe sorting through some clothes. Zero Waste Fair – Fri. April 26th 12-3PM: It’s time for DIY Tie Dye! Come out to Memorial Glade to help give new life to old white clothing at this fair. There will also be a clothes swap happening, so bring out some clothes that you’d like to exchange! Speaking of exchanging clothes, the sale at the store is 2x the value on trade-ins. That’s right, when you bring in an item to donate at the ReUSE Store, you can get another item that is worth twice as much! Get on that spring cleaning – there’s lots of new items at ReUSE to check out. If you’ve stopped by the store recently, you may have noticed the store has an entirely new look. Thanks to the Store Committee for doing such a great job reorganizing the store! Interested in joining one of ReUSE’s committees? It’s not too late! Fill out this form to get involved with ReUSE’s Events, Stations, Store, or Outreach committees. In our general meetings in February and March, we designed new signs for the store, organized lots of clothes, and planned new events while enjoying snacks with friends. Come join us at the next General Meeting, Thursday 3/21 from 7-8pm in the store! We’ve almost reached the date for the first tier of Active Members Perks! Members who have at least 15 perk points will be treated to frozen yogurt. The second tier (45 perk points) will be at the end of the semester, so look out for that! Thank you to everyone who has volunteered this semester! Even one or two hours a week makes a difference, since it allows more people to donate, shop and pick up some cool free stuff! The Repair Clinic is busy taking orders! Stop by the store whenever we are open to drop off your clothing items with small tears or missing buttons. 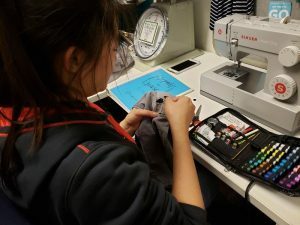 There is a Repair Clinic Workshop on 3/14 in Unit 1 APR at 5:30 pm where you can learn how to perform common clothing fixes, and receive a free sewing kit! There will be more workshops coming up this semester as well. Sale alert: Dresses are 50% off from now until Spring Break! The Repair Clinic is now open! The Repair Clinic is a free clothing repair service for UC Berkeley students and staff, aimed at reducing textile waste on campus. The clinic repairs small rips and missing buttons and will be run out of the ReUSE Store. It will be open for clothing pick-up and drop-off during general ReUSE hours. Our first general meeting will be Thursday 2/21 at 7PM in the ReUSE Store. We’ll be putting items that were donated over winter break onto the racks and separating out items which have been in the store for a long time. As with all sorting meetings if you come help out and you find an item that we are sorting (not already on the racks) that you’d like, you can take it for free. Snacks will be provided! To plan for the future, keep in mind that we will hold general meetings every other week on Thursdays at 7PM. These meetings are completely optional, but we try to make them fun and encourage you to come get to know your fellow ReUsers through them! Apologies for not linking the slides from our infosession before. Here they are, for those of you who couldn’t make it. Previous volunteers, please notice we have an exciting change: active member rewards. We will be encouraging volunteering at events and in the store by having special treats. The first threshold is that if you have earned 15 Perk Points by March 15th, we’ll take you out to Yogurt Park. To clarify, this is based on the total number of perk points you have earned for the semester – feel free to spend your perk points as usual without worry. ReUSE’s infosession is this Tuesday, 2/5 at 8pm in Dwinelle 130. Come out to find out more about how ReUSE works, what our plans are for the semester, and to meet new ReUsers! Even if you are already an active ReUSE volunteer or member, it’s always nice for potential members to have a chance to meet you and hear about your experience with us. Also, we’ll be having cheesy sticks! Hope to see you there. Please note that some of the flyers we passed out had a mistake on them, advertising that our infosession was on Thursday, 2/5. In reality, February 5th is a Tuesday and that is when the infosession is. Sorry for any confusion this caused! The infosession flyer doubles as a coupon, so if someone brings it into the store anytime this week they can get one accessory item for free! Thanks so much to everyone who volunteered this week! Don’t forget that our shift schedule rolls over, so if you signed up that means you are automatically signed up for the upcoming week as well. Try to remember to remove your name from the schedule at least 24 hours before that shift, if possible. What’s coming up next with ReUSE? Keep an eye out for information about a Repair Clinic opening up in the store very soon! Also, our first general meeting will be Thursday 2/21 at 7pm in the ReUSE store. We hope you all had a great winter break. ReUSE sure did! We collected a lot of donations over the break and were able to donate our proceeds from last semester. Thanks to you, we were able to donate $1600 to the cause of the California fires, 75% of which supported gift cards for fire victims to get their lives back on track and 25% which planted new trees to replenish those that burned. Ready for what’s coming up with ReUSE? Wednesday, Jan 23, 9am-3pm. We need your help to make this happen! Please sign up to help volunteer at the event to help pass out free office supplies. Don’t forget, event volunteers earn 2x the perk points. Monday, Jan 28. Past volunteers will be able to sign up for shifts as usual. Wednesday, Jan 30, 11am-3pm. Come find our table in Pauley Ballroom – we’ll be giving out textbooks and office supplies! Tuesday, Feb 5, 8pm-9pm. Even if you already know all about us, it’s nice for newcomers to get a chance to meet current members. Snacks will be provided! Looking forward to seeing you all soon! As always, we’re looking out for new volunteers who can help ReUSE remain a positive force on campus. The store is now closed for the semester. We will continue to monitor the bins outside of the store, on the 2nd floor of MLK, and on the 3rd floor of Moffitt Library for reader and textbook donations until Friday, December 14th. We look forward to seeing you when we reopen in Spring Semester! Fall semester has flown by! ReUSE members have been busying keeping the store open and participating in committees to get the word out about ReUSE and sustainability, with many sales and happy customers over the past few months. In addition to club meetings every other week, we’ve hosted a few events of our own! We had a successful Freecycling event on October 17th on the steps of Sproul Hall. We gave away clothes and office supplies for free and partnered with Madewell for those wanting to donate jeans. One week later, we learned how to make DIY tote bags from shirts at our General Meeting and then taught others on Memorial Glade from 1-3PM for Zero Waste Month. In addition, we’ve collaborated with the Butterfly Effect, a group that decorates wooden butterflies and hides them around Berkeley for others to find, leaving hints on social media. When a butterfly is discovered, the person who found it can choose a charity of their choice to be donated to. Butterfly Effect provided us with some wooden butterflies and painting supplies, which we painted at one of our General Meetings. ReUSE also partnered with EthiCal for a Give Two, Get One event. This means that if you donated two shirts to ReUSE, you could get a shirt from EthiCal for free on Thursday, Oct. 11th. We’re looking forward to a successful end of the semester with a Reader and Textbook collection during and immediately after Finals Week, as well as donating our semester’s profits to a charity chosen by our active volunteers! Our final General Meeting of the semester will be during the last week of classes, Tuesday 11/27 from 6 – 7pm. We will be open during RRR week, but closed during Finals Week until we reopen in Spring Semester. ReUSE will be having store sorting during our general meeting this week! Come out to the ReUSE Store this Tuesday, September 11th, at 6pm to help out. We will be going through donations that we accumulated from Move Out and throughout summer. As our way of saying “thank you” for your help, you can take anything you find while sorting for free! First dibs on items not yet on the racks and anything you want for free? We’ll see you there. Don’t forget to sign up to join a committee if you haven’t yet! This is completely optional, but it’s a fun way to get to know other members while getting more involved with ReUSE. Committees accept new members all year round. The Events Committee plans and carries out sustainable events such as giveaways on Sproul and free tie dye-ing of donated white shirts. The Outreach Committee creates flyers to advertise ReUSE and manages our social media platforms. The Stations Committee visits ReUSE stations around campus, where students can drop off items or take items for free. This committee is in charge of stocking stations with office supplies and making sure they are in good condition. The Store Committee is responsible for managing the store, tracking records, decorating, and coming up with sales. If any of these committees interest you, fill out this form to join one! Thank you everyone who came to the Infosession on Thursday night! We are always open to have new volunteers. Please contact ucberkeleyreuse@gmail.com to find out when our next training session will be held, or schedule a time that works for you! Without volunteers, we cannot fulfill our mission of keeping items out of the landfill and helping students save money. You’ll earn store credit as an added perk! Visit the store any time to learn more, or simply drop by to pick up a free binder or textbook for the semester. Welcome back! ReUSE will resume normal Monday – Friday hours next week (August 27). We are open on Saturday, August 25th for back to school shopping. Come pick up your free textbooks, readers and binders! You are invited to the ReUSE Infosession / General Meeting on Thursday, August 30th, 8pm at Barrows room 50! We’ll introduce the club and explain how you can get involved. Hope to see you there!